Even though our heritage lies in high-quality denim, that’s not all we do. 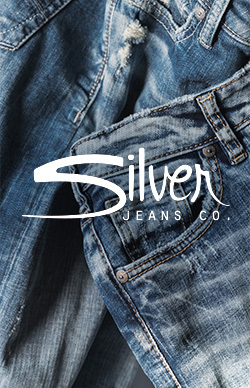 Here at Silver Jeans Co., we provide every trendsetter with the styles she needs to look good. Whether you’re on the hunt for a breezy, bohemian-style tank, classic plaid button-down, tried-and-true denim jacket or that perfect pair of jeans (of course), you’ve come to the right place. Let’s be real: a great outfit starts with a great pair of jeans. Our women’s designer jeans are crafted in several different fits to cater to every body type. So whether you’re perfectly straight or have curves for days, there’s a fit that will flatter your shape and feel amazing. Oh, and there’s countless indigo washes, rises, details and leg openings to choose from, too. After you find the perfect pair of women’s jeans, you have to find a cute top to match. A fun graphic tee, babydoll tank or peasant blouse are great everyday options. Complete the look with our classic Sherpa Denim Jacket or lightweight Utility Shirt. Or, if you’re looking for a more quick and easy outfit, try a one-piece like our Plaid Tank Dress or Denim Dress. Our women’s designer clothing collection has everything you need to stay on trend, all the time. Vintage, classic, feminine, edgy, fashion forward—no matter your style, Silver Jeans Co. women’s denim and apparel collection has the look you want. And not only that—all of our women’s designer clothing and jeans are made with the highest quality fabrics, and are all offered at a price you can afford. So don’t limit yourself to just one new pair of jeans. Find your perfect fit and get it in every wash, rise and leg opening. Plus, we’re always adding new jeans and clothing to our women’s collection, so keep checking back for the latest arrivals at SilverJeans.com.